This is not a Harry Potter film. That might seem obvious from the title, but it bears repeating. Since the release of the first book way back in 1997, the fans have grown up. Now there's a more serious, adult film that caters to them. Yes, there are plenty of magical creatures to please little ones (even though it's a 12A film). There are cuddly critters, majestic beasts and some very strange looking insect-things, all produced with sensational CGI and effects. And the film is littered with amusing touches that add some much needed light-hearted humour. But there's a dark underbelly here. This isn't a film about a children's school, with loveable teachers and lessons (both literal and philosophical) to be learnt. This is a film about child abuse. About racism. And very dark magic. 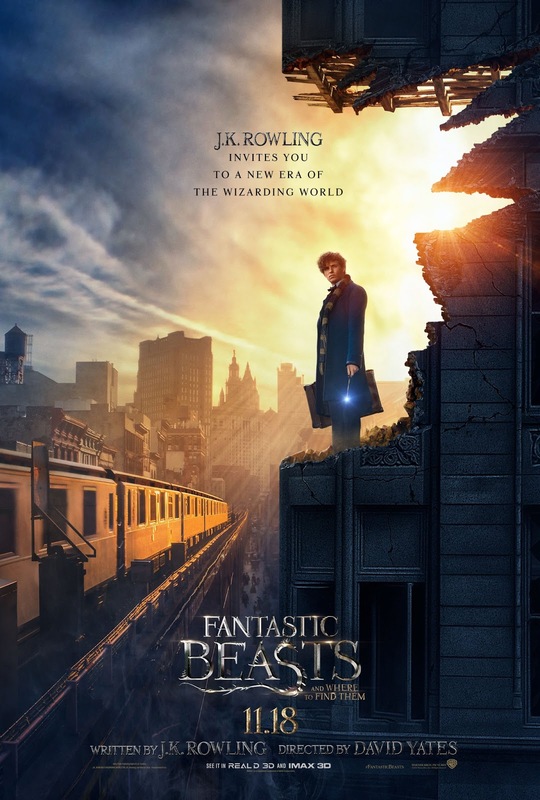 Set in America in the 1920s, we follow Newt Scamander (a jittery, awkward Eddie Redmayne with an irritating pout), a wizard with a very special briefcase full of magical creatures. A mix up leads to these creatures being released into the city and what follows is a Ghostbusters style rescue mission. Yet this America, much like today, is rife with hate. Wizards live undercover and fear revealing their world to the No-Majs (the American equivalent to Muggles); the No-Majs hunt the wizards (not unlike the Salem witch trials); the wizards have banned magical creatures through lack of understanding; and they even hate themselves. The plot hinges on an obvious parallel to gay conversion therapy - when wizards attempt to suppress their powers instead of being true to themselves, it festers into powerful dark magic that wrecks havoc. Freud would have a field day. And that's on top of the obvious ecological message of caring for the environment and endangered species. Like Newt's briefcase, the film is stuffed to bursting point with layered meaning and sociological themes - it's just not very subtle about it. Thankfully, Fantastic Beasts remains a throughly enjoyable watch that allows us to view Rowling's universe from a very different perspective. There's wizards, magic, wands, creatures and a Magical Congress, but its real world setting of New York is a long way from the beloved fantasy school. The sets and costumes are stunningly created, but the cinematography has a washed out feel as if we're watching history - fitting considering the film is based on a school text book. With its seedy underground, corrupt governments, stark lighting and heavy air of mystery, it has the air of a noir thriller, but filled with colourful characters - Rowling's Robert Galbraith books meets Potter. The creatures have far more personality than the mostly likeable leads, though Colin Farrell makes a gruff Auror as Percival Graves and Ezra Miller is disturbing as Credence Barebone. Dan Fogler's No-Maj Jacob Kowalski steals the film though, not only as our portal into this magical world, but providing most of the film's laughs. Somehow Rowling and director David Yates have achieved the impossible, by making a film for everyone: fans and newcomers, young and old. The plot may be predictable and ultimately a little cheesy whilst setting up the inevitable sequels, but its irresistible concoction of warm storytelling and delectable darkness make this film's magic undeniable. Watch: Fantastic Beasts and Where To Find Them is out now.